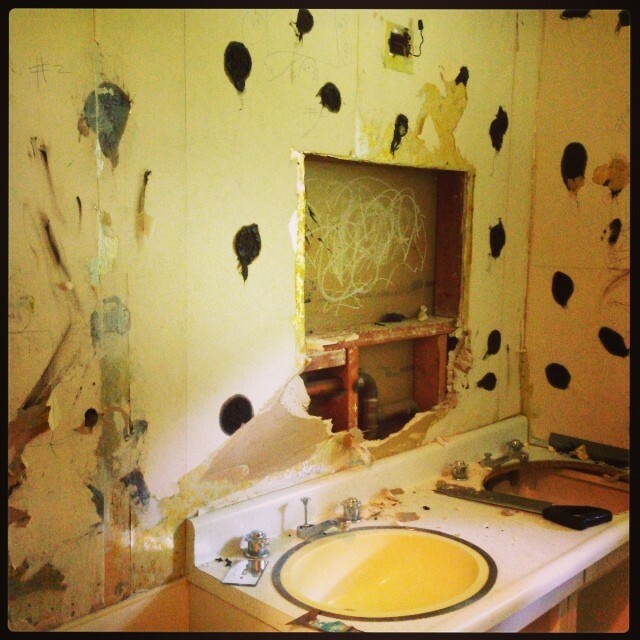 If it’s true that the kitchens and baths sell a house… then I’m not quite sure how we ended up with this house. Ok, I know exactly why we bought this house–it’s right around the corner from my job, the lot is lovely, the layout is spacious, and, furthermore, there just weren’t that many options. I like this house. Despite its shocking lack of turrets (my ideal mid-century is really a century earlier), I might even be getting to love it, though the ice dams and roof leaks tempered my affections this winter. 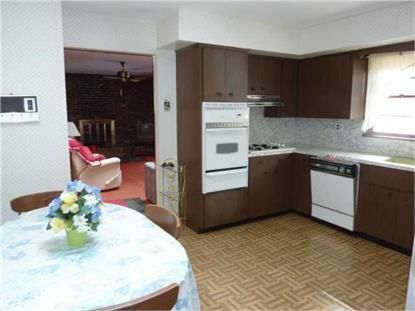 And really, I’m glad that nobody cherry-cabinet-ed and granite counter-ed the kitchen before we got to it. But this living museum has started to break down a bit; after decades of limited use (the original owner was in her nineties when she sold it to us), things are creaking and cracking under the pressure of their new workload. We can talk about the kitchen more another day–or another year, if I keep up with my current blogging pace. Things are in full swing around here; spurred on by some drywall damage during the aforementioned ice dam attack, walls are coming down in just about every room. Our house has two bathrooms–the yellow is a full bathroom off the hallway in the bedroom wing of the house, and there’s a small and largely unremarkable 3/4 bath occupying a closet-like nook in the master bedroom (which you will recognize by virtue of its alarming wallpaper). As for the tub and the tile surround–should I start a new chapter of this?–I don’t hate it. Ricky has fond memories of being bathed in a similar tub when he was a child, the tile is in good shape, and it certainly suits the era of the house. In Madison, I kept the old cast iron tub (it was white…) and replaced only the tile; I learned that these old tubs are mostly nicer than the replacement options. They are deep; they hold the heat well. And they are very, very heavy to move. 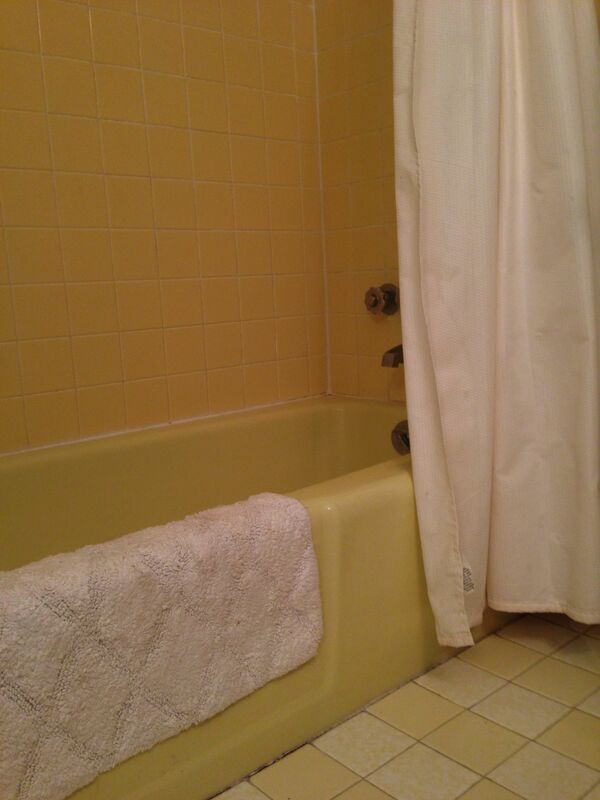 So our plan for the yellow bathroom is to gut everything except for the tub and tile surround. 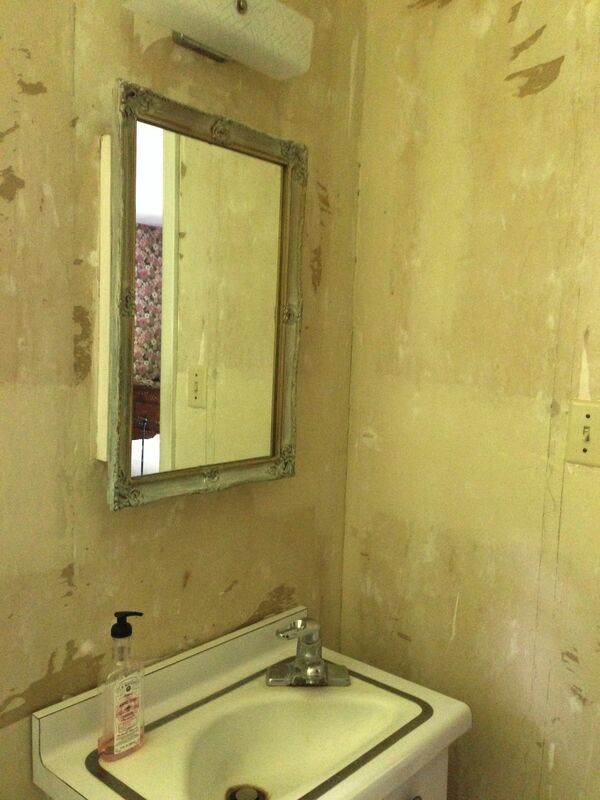 The double vanity is going to be replaced by a single pedestal sink; there’s a huge linen closet next to the tub, so we don’t need the storage. The extra sink only gathers dust because we never use them at the same time. I chose something vintage-y for the floor, but I’m a bit anxious about how it will all come together. My hope is that by swapping out some of the scary yellow fixtures, we can work with the tub and make the room look like a better version of its own vintage. This is my dream, which will, of course, be tempered by a touch of bumblebee in our reality. The idea of getting rid of the tub actually made me feel a twinge of anticipatory regret/guilt; we’ll see how I feel in a few weeks. Please forgive me for any typos contained herein; whilst the baby naps, I type furiously. These days, it’s either bad writing or none. *One wonders what Charlotte Perkins Gilman would have had to say about yellow contact paper; it’s so much more sinister. I think there’s a conference paper in there somewhere. when life gives you yellow bathrooms, you…make them black and white bathrooms and pretend the yellow is an accent? that’s been my plan. are you doing the tiling yourself? i am very excited to retile my bathroom floor but i (a) don’t know how and (b) am scared of the toilet, which needs to be replaced anyways.